It's been 2 months since my last entry. Forgive me for I have been too busy that blogging has to take a backseat ... once too often. This sounds like I'm making a confession. And Christmas just round the corner ... haha!! 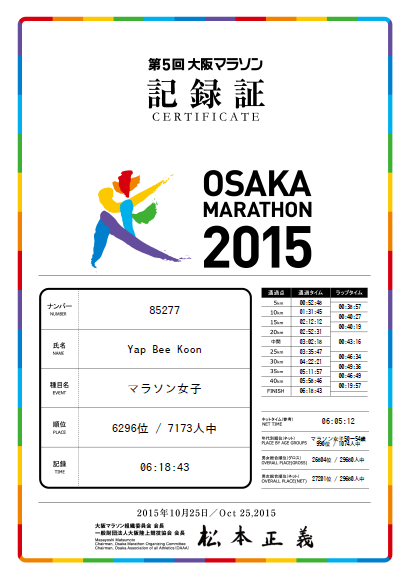 In busyness, time really flies. Let's see what I have been up to off late. I am now a half-centurion plus 2 and I am so happy that I have finally completed my half-centurion birthday wishlist. FINALLY!!! 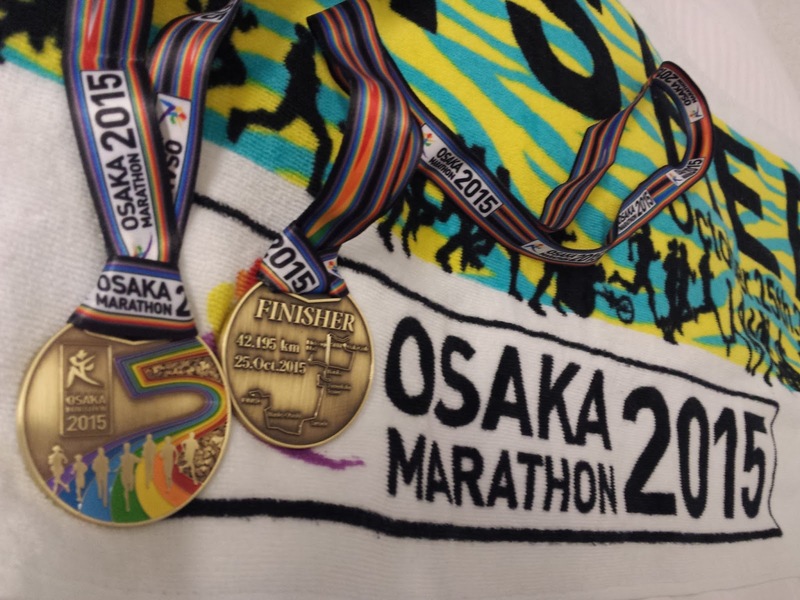 I pursued my virgin FM (full marathon) in October 2014 in Osaka, Japan but I had failed to complete the run due to a leg injury suffered during my training for TMBT Sabah that was held in August 2014. One was a first try and the latter a second ... both unsuccessful! 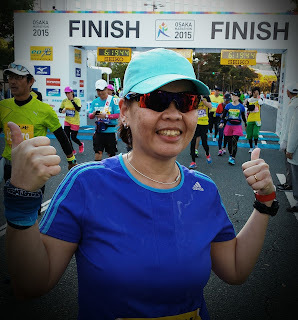 As I have given up on joining the ultra-trail run in Sabah ... ever ... 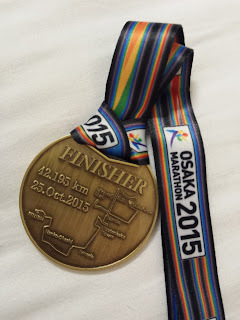 I gave it a second shot to complete the full marathon in Osaka on 25 October 2015. With lo kong a willing pacer, I managed to complete it in 6 hours 5 minute ... a timing that I am very surprised to have achieved. 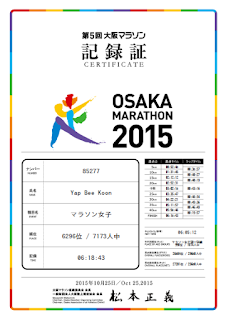 I would have been most happy to have just completed the run closed to the cut-off time of 7 hours. 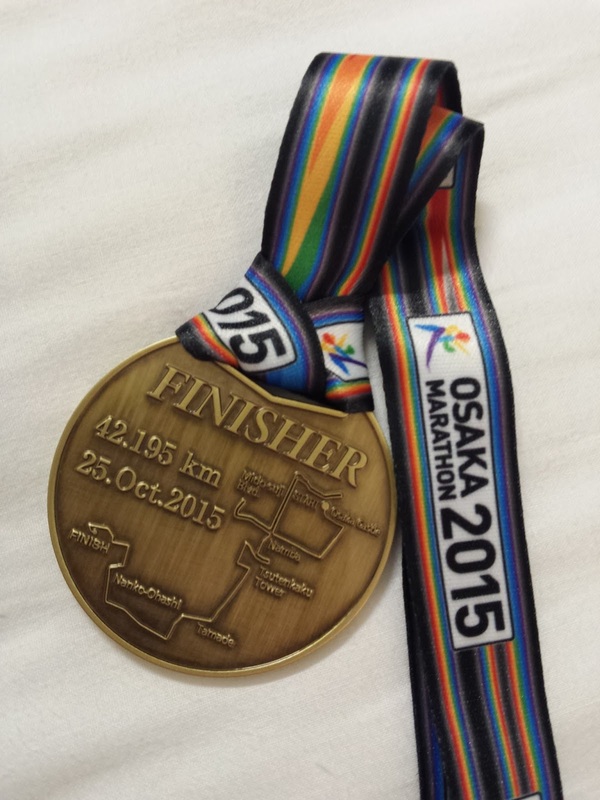 With this medal in hand, I am moving on to other adventures or may be challenges. Let's see ... the plans aren't in place yet.